Photo: Typical Chinese dishes, including spring rolls, fried chicken, wonton dumplings and fried noodles. 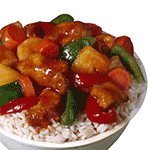 China is a huge country with many regions, and each region has its own kind of food. In the colder regions of northern China, for example, crops like wheat can be grown. Grains of wheat can then be ground into a flour that's used to make a wide range of foods including noodles, dumplings, breads and steamed buns. 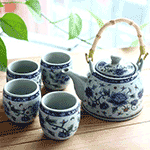 But in the warmer regions of southern China rice is grown instead. Most meals in the south are eaten with steamed rice, and rice is also used to make things like porridge, flour, noodles, rice cakes and pancakes. 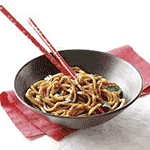 In northern China wheat flour is used to make both wheat noodles and egg noodles. 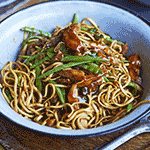 One of the most famous northern dishes is chow mein which is made by stir-frying egg noodles with meat or tofu, a soft white protein-rich food made from soy milk. Vegetables and other plant-based foods common in China can also be added, such as bok choy, napa cabbage, Chinese broccoli, watercress, leeks, garlic, chilli peppers, straw mushrooms, bean sprouts, bamboo shoots, and very young onions called spring onions, green onions or scallions. Other foods popular in the north include steamed buns with vegetable, bean paste or meat fillings that are often eaten for breakfast. 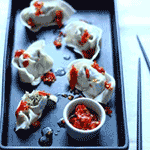 Boiled or pan-fried dumplings with fillings of meat or vegetable are also popular, and usually served with a dipping sauce like vinegar or hot chilli oil. One of the most famous northern dishes is Peking duck in which thin slices of roasted duck skin are eaten in wheat-flour pancakes with spring onion, cucumber and a sweet bean sauce. 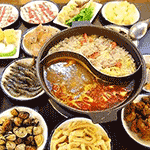 Many kinds of hot pot containing a wide variety of meats, vegetables, herbs and spices are also widely-eaten, as are thick soups containing noodles or dumplings and grilled or roasted meats and meat-based stews. 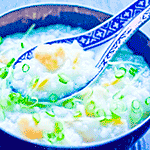 In the warmer regions of southern China most dishes are eaten with bowls of steamed rice. The most famous dishes include those made with sweet and sour sauce such as sweet and sour deep-fried pork and sweet and sour chicken. 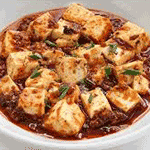 Other famous southern dishes include Kung Pao chicken, a delicious stir-fried mix of chicken, peanuts, vegetables and chilli peppers, and a spicy dish called mapo tofu that's made with tofu, ground beef or pork, a spicy fermented bean paste and soy sauce, a 2,500-year-old Chinese condiment that's become one of the world's most popular flavourings. Rice isn't only steamed and eaten with other dishes. 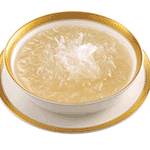 It's also used to make congee, a rice porridge often eaten for breakfast in southern China. It's also ground into rice flour to make rice cakes and pancakes as well as very thin noodles called rice vermicelli. These noodles are often cooked in soups with fish balls or beef balls, or fried with egg, shrimp, spring onions and other ingredients to make a dish called fried rice vermicelli. 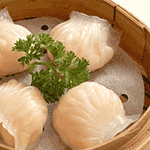 A traditional Chinese dumpling known as wonton is also used in many dishes such as wonton soup in which shrimp-filled wonton are cooked in a broth with rice vermicelli. 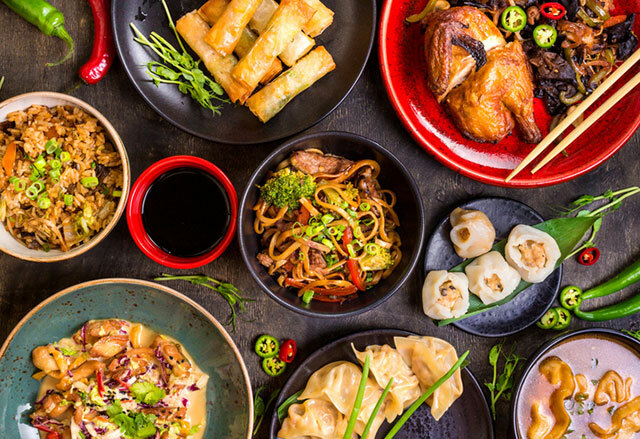 People who don't live in China, or who aren't part of the worldwide Chinese diaspora, might think that the dishes served in Chinese takeaway restaurants in their neighbourhood are all there is to Chinese food. But the food sold in these places is usually just a small range of dishes that have become popular locally or worldwide. 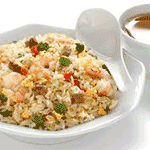 One such dish is Yangzhou fried rice, also called special, house or combination fried rice. In this dish pre-cooked steamed rice is fried with other ingredients like pork, shrimp, egg, peas, diced carrot and bean sprouts. 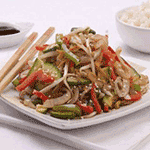 Another example is chop suey, a Chinese-American dish of chopped meat and vegetables in a thick sauce that most people in China itself have never heard of. 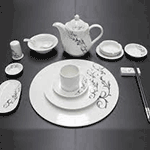 There are also many Chinese dishes that have become popular in a few countries without becoming popular worldwide. One of these is Hainanese chicken rice which is very popular in Singapore, Malaysia and Thailand, but virtually unknown in other countries. Chinese appetizers like spring rolls and snacks like dim sum have also become famous and widely-eaten all around the world. There are other Chinese foods that are famous not because they're widely-eaten, but because they seem strange to non-Chinese people. 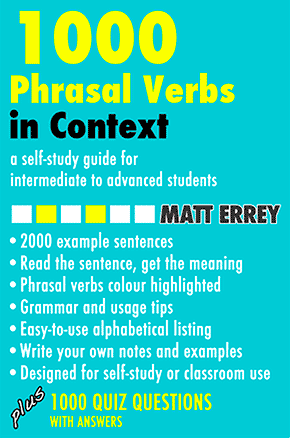 Examples include bird's-nest soup made from the saliva of certain birds, preserved eggs called hundred-year eggs that turn a dark grey or greenish colour, traditional mooncakes that are only baked during the mid-autumn full-moon festival, and shark fin soup, a dish that many people think is wrong to eat because of the large number of sharks killed every year for their fins. 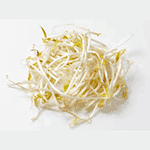 bean sprouts (also US "sprouts") (noun): edible young stems growing from beans or seeds - I'm frying some Chinese vegetables and bean sprouts. 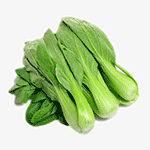 bok choy (also "pak choi") (noun): a Chinese vegetable with white stems and dark green leaves - Chop up some bok choy and fry it in a wok. 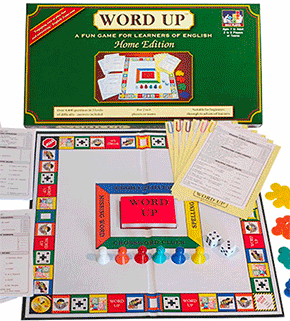 chop suey (noun): a Chinese-style dish of meat, eggs and vegetables in a thick sauce - Chop suey is served in Chinese restaurants all over the USA. chow mein (noun): a Chinese-style dish of fried noodles with vegetables and meat or seafood - Is there any of that chicken chow mein left? congee or conjee (noun): a Chinese rice porridge with various meats and vegetables added - Mum gets up early and makes congee for breakfast. diaspora (noun): a large group of people who come from a particular place and now live in many other parts of the world - The Chinese diaspora spread out from Asia in the nineteenth century. dim sum (also "dim sim") (noun): fried or steamed dumplings of many kinds - Let's have lunch in one of those dim sum restaurants. dumpling (noun): a small ball of dough and other ingredients that's boiled, fried or baked - We'll have a plate of pork dumplings, please. 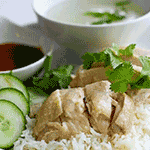 Hainanese chicken rice (noun): sliced boiled chicken served with rice cooked in chicken broth - Hainanese chicken rice is called khoa man ghai in Thailand. hot pot (noun): a Chinese dish in which one or more soups are cooked in a special pot at the table - Let's have the hot pot with sliced meats, vegetables, mushrooms and dumplings. hundred-year egg (also "century egg") (noun): Chinese-style preserved chicken, duck or quail egg - Are hundred-year eggs always green or black like that? 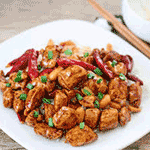 Kung Pao chicken (noun): Chinese stir-fried dish made with chicken, peanuts, vegetables and chilli peppers - Kung Pao chicken is eaten all over the world these days. mapo tofu (also "mapo doufu") (noun): a dish of tofu and minced meat cooked in a spicy paste of fermented beans - The mapo tofu was a bit too spicy for me. 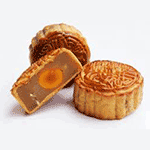 mooncake or moon cake (noun): a round Chinese cake only eaten during the mid-autumn full-moon festival - Where did you get these mooncakes? Peking duck (noun): thinly-sliced roasted duck skin served with vegetables and pancakes - Peking duck's served with spring onion, cucumber and sweet bean sauce rolled up in pancakes. 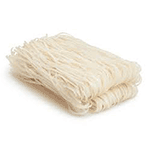 rice vermicelli (also "rice noodles") (noun): very thin noodles made from rice flour - Get the biggest packet of rice vermicelli they've got. 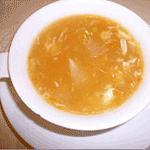 shark fin soup (noun): traditional Chinese soup containing shark fins - You don't eat shark fin soup, do you? soy sauce (also "soya sauce") (noun): a dark liquid made from fermented soy beans that's used as a sauce - Can you pass the soy sauce, please? 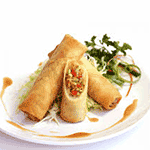 spring roll (also US "egg roll") (noun): a fried or unfried appetizer of minced vegetables with or without meat rolled in rice paper - For starters, we'll have fried spring rolls and pork satay. sweet and sour sauce (noun): a sauce made of sugar or honey and a sour liquid like vinegar or soy sauce - We make our own sweet and sour sauce. tofu (also US "bean curd") (noun): a soft white protein-rich food made from soy milk curds - Where can I buy freshly-made tofu? 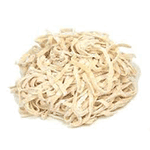 wheat noodles (noun): noodles made from wheat flour and water - In northern provinces people eat wheat noodles all the time. 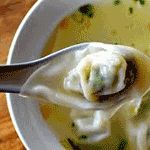 wonton (noun): a Chinese dumpling made by wrapping a filling of minced meat, seafood or vegetable in wheat dough - Wontons can be boiled, put in soup or deep-fried. Yangzhou fried rice (also US "house fried rice" and UK "special fried rice") (noun): a dish made by frying pre-cooked rice with pieces of pork, shrimp, egg and vegetables like peas and carrot - Dad always orders sweet and sour pork and Yangzhou fried rice.